A BBC camera crew moved on site to record footage from our latest book which chronicles the history of a unique collection of Modernist buildings at DZG. Towers and Tectons: A View from the Hill, by Jill Hitchman, which also highlights conservation and research work at DZG, features the site’s iconic Tecton buildings which have received international status from the World Monument Fund. 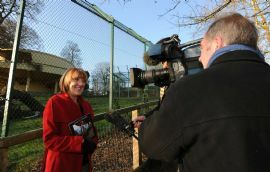 The Beeb team interviewed Jill and DZG Chief Executive, Peter Suddock. The 12-strong group of buildings, set around the 11th century Dudley Castle, forms the largest collection of Tectons in the world. Designed by renowned architect Berthold Lubetkin, a Russian emigre, they were constructed between 1935-37 using reinforced concrete, and are recognised as of immense architectural significance within the Modernist movement. CAPTION: The BBC team film author Jill Hitchman, with her book Tectons and Towers: A View from the Hill, against the backdrop of the former birdhouse, one of the iconic Modernist buildings at DZG.